The meeting will feature panel discussions including representatives from state and regional agencies, Tribal Governments, and organizations representing environmental, equity, land-use, and business perspectives. Panel discussions will identify important issues for consideration in the development of both regional and statewide regional transportation planning guidance. The meeting will initiate a stakeholder-driven process to concurrently update the RTP Guidelines and develop the CTP Guidelines for Commission consideration at the end of the calendar year. Since the mid-1970s, with the passage of Assembly Bill 69 (AB 69, Chapter 1253, Statutes of 1972) California state law has required the preparation of Regional Transportation Plans (RTPs) to address transportation issues and assist local and state decision-makers in shaping California's transportation infrastructure. On July 1, 2009, the California Transportation Commission (Commission), upon consultation with the California Air Resources Board and the California Department of Transportation (Caltrans), formed an Advisory Committee to prepare necessary revisions to the Commission's RTP Guidelines in response to the requirements of Senate Bill 375 (SB 375, Chapter 728, Statutes of 2008) and other factors. As required by Government Code Section 14522.1(a) (2), the Commission's Advisory Committee included representatives of the metropolitan planning organizations, Caltrans, organizations knowledgeable in the creation and use of travel demand models, local governments, and organizations concerned with the impacts of transportation investments on communities and the environment. The 2010 RTP Guidelines, adopted by the Commission in April 2010, incorporated new planning requirements as a result of SB 375 and incorporated the addendum to the 2007 RTP Guidelines. Updates to the Commission’s 2010 Regional Transportation Plan Guidelines are necessary in light of changes to state statute, impending final rulemakings pursuant to the previous federal reauthorization, and recent passage of the Fixing America’s Surface Transportation (FAST) Act of 2015. Updates are also needed to reflect advances in the practice of long-range regional transportation planning, including, but not limited to, improvements in the areas of modeling, public health, and other possible items which may impact the regional transportation plans and statewide transportation plans. The California Transportation Plan (CTP) is a long-range (20-year) plan prepared every five years by Caltrans to provide a common policy framework to guide transportation investments and decisions by all levels of government, the private sector, and transportation stakeholders. Guidelines will be developed to increase assurance that the CTP supports a fully integrated, multi-modal, sustainable transportation system that promotes economic vitality, natural resource protection, and the health, well-being, and equity for all Californians. Senate Bill 486 (SB 486, Chapter 917, Statutes of 2014) authorized and encouraged the Commission, in cooperation with Caltrans, to prepare guidelines for the development of the CTP. The CTP Guidelines will clearly outline the state and federal requirements for the plan and will help inform preparation of the CTP 2045 which is due in 2020. The CTP Guidelines will be developed concurrently with the update of the RTP Guidelines, through a transparent public process with stakeholder input and in direct consultation with staff from Caltrans, the Air Resources Board, and other state agencies as appropriate. The Regional Transportation Plan (RTP) Guidelines are undergoing an update process that is scheduled to occur from July through December 2016. The California Transportation Commission (CTC) anticipates consideration of the Final RTP Guidelines later this calendar year. Below is a detailed timeline for the update process. The RTP Guidelines are being updated in tandem with the development of the California Transportation Plan Guidelines. Click here for information about the CTP Guidelines process. RTP Workgroups will meet during the months of July and August and will require a considerable time commitment on behalf of all participants. Dates for initial workgroup meetings (see tentative schedule below) are scheduled to occur on July 13-14 and will be approximately 1 hour in duration for each topical area. Workgroups could potentially meet a second time in July/August, depending on the subject matter and resolution of any comments/revisions for the RTP Guidelines. The public comment period for the Draft RTP Guidelines begins Wednesday, July 6, 2016 and ends Friday, August 5, 2016, 5:00 PM PST. 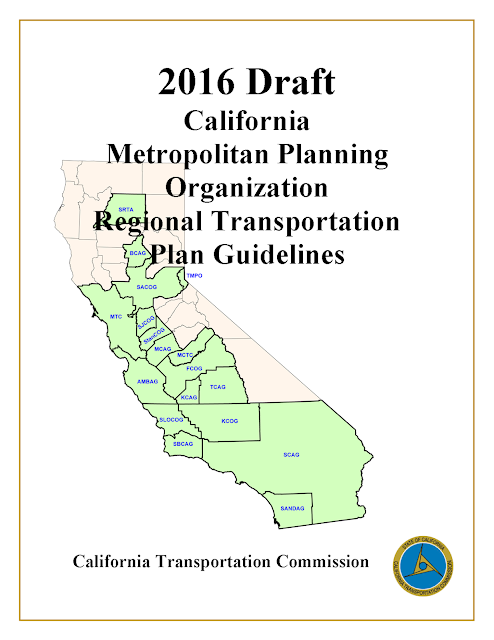 2015 Regional Planning Handbook Section 7 – Regional Transportation Plan (RTP), provides the RTP administrative requirements for Caltrans Districts and Headquarters staff. This Section should be reviewed well in advance of receiving a draft RTP during the public commenting period. 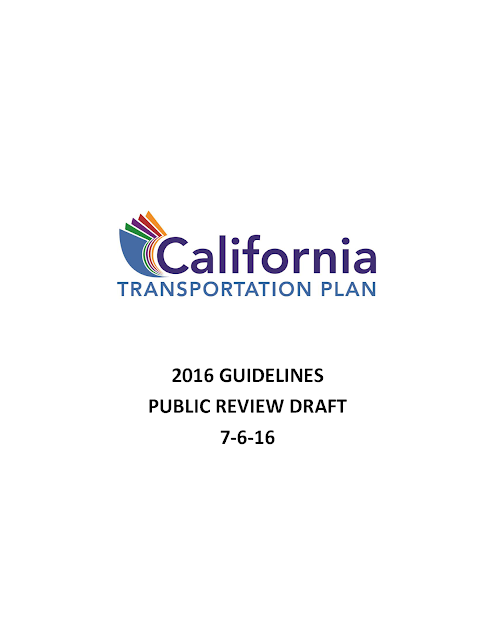 The California Transportation Plan (CTP) Guidelines are undergoing development that is scheduled to occur from July through November 2016. The California Transportation Commission (CTC) anticipates consideration of the Final RTP Guidelines later this calendar year. Below is a detailed timeline for the update process. The CTP Guidelines are being updated in tandem with the development of the Regional Transportation Plan (RTP) Guidelines.Click here for information about the RTP Guidelines process. Interested CTP Workgroup participants whom would like to partake in the CTP Guidelines process should submit an email to:CTP@dot.ca.gov. The CTP Workgroup will meet during the month of July. Meeting dates for workgroups are scheduled to occur on July 13-14 and will be approximately 30 minutes to 1 hour in duration for each topical area. The public comment period for the Draft CTP Guidelines begins Wednesday, July 6, 2016 and ends Friday, August 5, 2016, 5:00 PM PST.